John M. H. Kelly is from Skidegate, Haida Gwaii, sometimes referred to as the Queen Charlotte Islands. Dr. Kelly is an adjunct research professor in journalism. He serves as co-director of Carleton University’s Centre for Indigenous Research, Culture, Language and Education (CIRCLE) and is a member of the university’s Aboriginal Education Council. 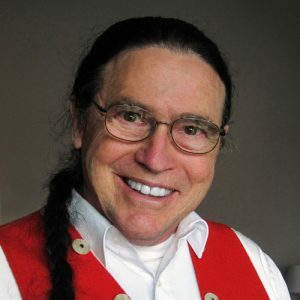 Dr. Kelly co-authored with Dr. Elaine Keillor and Timothy Archambault the Encyclopedia of Native American Music of North America ((Santa Barbara, Calif.: Greenwood Press, 2013). In 1992, Dr. Kelly began work with Indigenous language and cultural revitalization and preservation programs. He developed unique electronic recording and editing systems for creating language resources. Dr. Kelly trained community members throughout the Northwest how to use of these systems to record their elders. Dr. Kelly also was one of 15 Indigenous experts Canadian Heritage designated as leading language and culture authorities. In 2004-5, this Circle of Experts advised a 10-member Task Force to design a national Indigenous languages strategy.